Numerous European Churches dot the map of Kolkata, thanks to its history full of British, French, Portuguese and Dutch cultures. The Church is also known as “PathureGirja” (stone church) as it was built with a combination of brick and stone. It is a large structure built in the neoclassical architectural style. The large windows made of coloured glass and the designs add to the charm of this architectural marvel. The Church houses a representation of the Da Vinci’s“The Last Supper” by German artist Johann Zoffany. The walls contain memorial tablets, statues and plaques by British officers. The Church is also famous for Lady Charlotte Canning’s decorated memorial on its northern corridor. St John’s Church has gained the status of a national monument and has been restored by the Archaeological Survey of India (ASI). The Europeans had initially settled around BBD Bag and Lalbazar area which was close to first Fort William (where the GPO stands today). Near Burrabazarstands the Armenian Church of The Holy Nazareth (established 1707). To the east of Armenian Church and about half a km away is the Cathedral of the Most Holy Rosary between Brabourne Road and Canning Street. According to the Armenian College and Philanthropic Academy (ACPA) Armenians already had settlement in Kolkata much before the arrival of Job Charnock and settlement by the British. 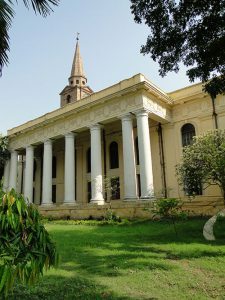 The Armenian Church continues to be the oldest Church of Kolkata. It was established in 1707. 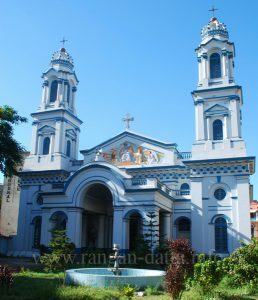 It is also called the “Mother Church Of Indian Armenians.” There are three Armenian churches in the city, the other two apart from the oldest structure “The Holy Nazareth” are – St Mary’s Church and church of St Gregory the Illuminator. The interior designed by Catchick Arakiel of the The Holy Nazareth structure is of marble, the walls are filled with frescoes and paintings. The altar of the church consists of twelve candlesticks symbolizing the twelve apostles of Christ. One will find three famous paintings by artist AE Harris – “Holy Trinity”, “Last Supper” and “The Enshrouding of Our Lord.” As per the agreement between the East India Company and the Christian Armenian community churches had to be builtthroughout the country in areas with at least 40 residential Armenians and a provisional salary of 50 pounds for priests residing in those churches . 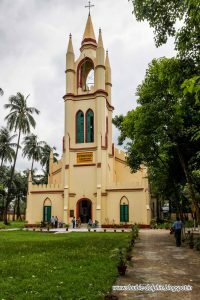 The Cathedral of the Most Holy Rosary aka the Portuguese Church, also locally known as the Murgihata Church was founded in 1799 and is the cathedral of the Roman Catholic Archdiocese of Calcutta. The interior contains beautiful sculptures including 14 Stations of the Cross(the Way of Sorrows – a series of images depicting Jesus Christ on the day of crucifixion). Below the church altar lie the remains of the first Archbishop of Calcutta. To a plot adjacent to Writer’s Building the Englishmen had set up St. Anne’s Church in 1716 which was demolished in 1756 during Siraj-ud-Daulah’s raid of the British held Kolkata. 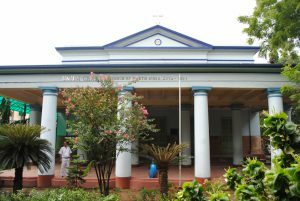 In 1770 Swedish Missionary John Kiernader set up the Mission Church by the side of Laldighi opposite Writer’s Building. The church was earlier known as Lal Girja because of the brick finished exterior and Lal Dighi got its name from the church’s reflection in the water. 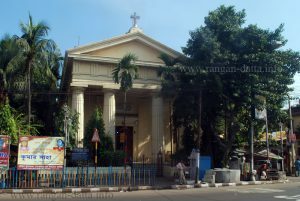 The Greek Orthodox Church, located inAmratolastreet was the first Greek Orthodox Church was opened to the public in 1781 but the establishment was later moved to Kalighat in 1925. However it looks more like a Greek temple with four columns and a portico. It is perhaps the youngest in the list of famous Kolkata churches. 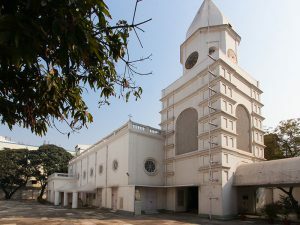 It is said that the first Greek Orthodox Church was first established in 1752 but it was later abandoned and a second one came up in Amratala area which was opened to public in 1781 but Kalighat later became the new location in 1924-25. Due to lack of members the Greek Orthodox Church had closed down in1960’s but Fr. Ignatios (Sennis) reopened the Greek Orthodox Church of Calcutta (Kolkata) in 1991. 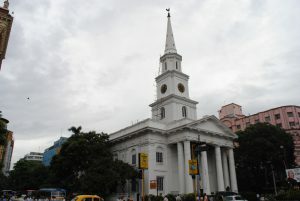 St. Andrew’s Church established in 1818 has been designated as a heritage building by the Kolkata Municipal Corporation (KMC). Today it is funded and supported by KMC, its heritage committee and INTACH (The Indian National Trust for Art and Cultural Heritage). The church still awaits major renovations. Many of the cast iron items like railings have been stolen and the beautiful gates faced a lorry crash after which a complete repair or replication of both the gates have been next to impossible. However the basic railing structures of the gates have been restored. Union Chapel was set up in Lenin Sarani (then called Durmtala Street/ Dharmatalla Street) in 1821. 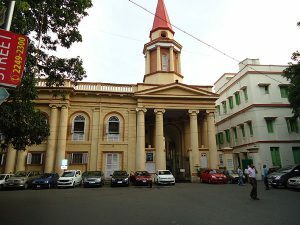 The chapel under Diocese of Kolkata started an “All White” Church but after World War II the Church had started accepting more and more Indian members, especially from 1950. Located in Middleton Row, St Thomas Church was set up on Free School Street in 1831. It is a Roman Catholic, Latin Rite church. Mother Teresa before her funeral was rested in state in this church for one week prior to her funeral, in September 1997. After several proposals from 1819 till 1832 and under Bishop Daniel Wilson, the project to build the cathedral was accepted. Queen Victoria had sent ten pieces of silver-gilt plates to mark the sanctification ceremony of the cathedral which was attended by many locals and Europeans. The Cathedral has stained glass windows, frescoes in Florentine Renaissance style. The nave of the Church has wooden pews and chairs. The tower on which the spire of the cathedral stands based on the design of Canterbury Cathedral of England. The roof has a shallow curve that arches over iron binds. Chunar stones, special light weight bricks and Chunam (lime plaster) were used in the construction. The cathedral is full of carvings depicting the life ofSt. Paul, the Annunciation, the Adoration of the Magi, and the Flight into Egypt, by Sir Arthur Blomfield. The cathedral’s organ made by Joseph Willis and Sons of London is still used today. The cathedral is surrounded by a well maintained and lush garden. The city is a treasure trove for heritage sites and whoever is out on a spree to explore the churches of Kolkata will never be disappointed. The churches of Kolkata reflect the city’s rich history. 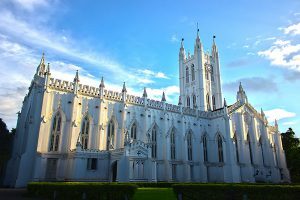 Among the many attractions that Kolkata holds for the tourists from all around the world, the Churches are a testament of Kolkata’s architectural glory as well.